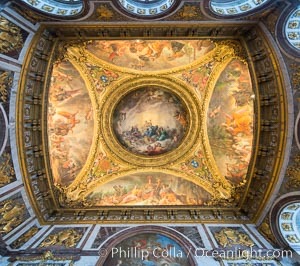 Ceiling art detail. Chateau De Versailles Photo. 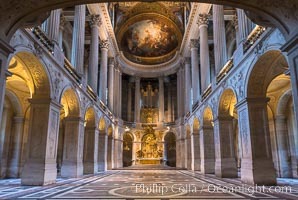 Royal Chapel of Versailles, dedicated to Saint Louis, patron saint of the Bourbons, the chapel was consecrated in 1710. It was here that Louis XVI of France was wed to Marie-Antoinette. 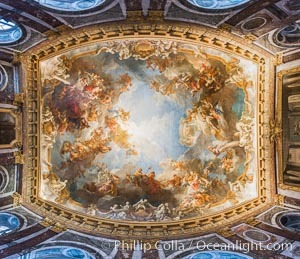 The ceiling represents God the Father in His Glory Bringing to the World the Promise of Redemption and was painted by Antoine Coypel. Chateau De Versailles Picture. Versailles Palace. 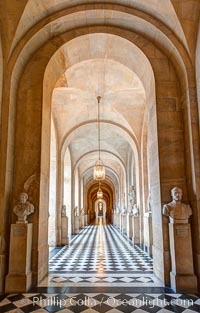 Stock Photography of Chateau De Versailles. 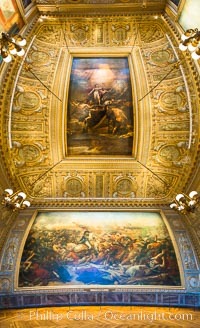 The Battle of the Nile, also known as the Battle of Aboukir Bay, in French as the Bataille d'Aboukir, panaramic photo showing wall and ceiling detail. Photograph of Chateau De Versailles. 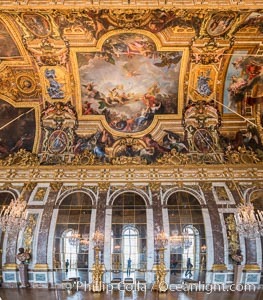 The Hall of Mirrors, or Galerie des Glaces, is the central gallery of the Palace of Versailles and is renowned as being one of the most famous rooms in the world. 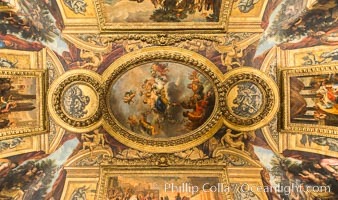 Chateau De Versailles Photos. The Battle of the Nile, also known as the Battle of Aboukir Bay, in French as the Bataille d'Aboukir. 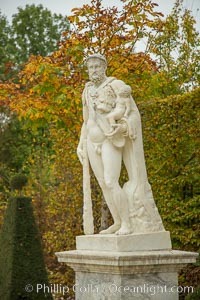 Chateau De Versailles Image. Statue, Chateau de Versailles Professional stock photos of Chateau De Versailles. Versailles Palace. Pictures of Chateau De Versailles. 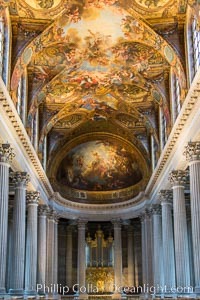 Royal Chapel of Versailles, dedicated to Saint Louis, patron saint of the Bourbons, the chapel was consecrated in 1710. It was here that Louis XVI of France was wed to Marie-Antoinette. 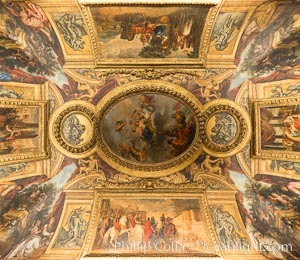 The ceiling represents God the Father in His Glory Bringing to the World the Promise of Redemption and was painted by Antoine Coypel. Chateau De Versailles Photo. Ceiling art detail. Chateau De Versailles Picture. 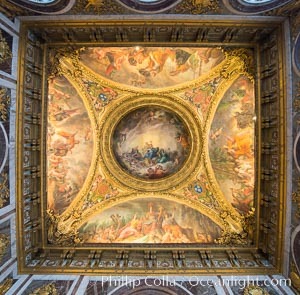 Ceiling art detail. 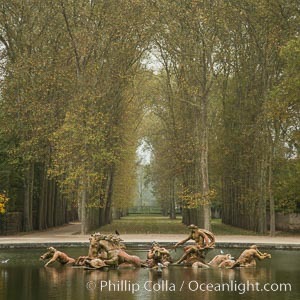 Stock Photography of Chateau De Versailles. Ceiling art detail. Photograph of Chateau De Versailles. Ceiling art detail. 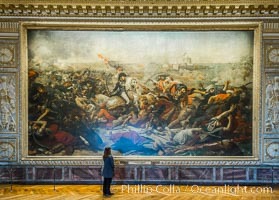 Chateau De Versailles Photos. Ceiling art detail. 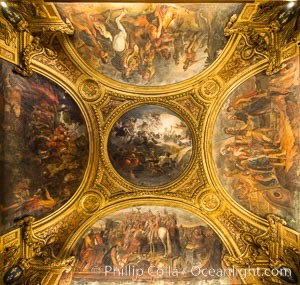 Chateau De Versailles Image.